Stairs are constructions meant to connect and provide access to two vertical distances. It is essential in any home with more than one level. But stairs are not only functional; they have the potential to be an aesthetic feature like the elegant yet simple stairs in the historic Rippon Lea Estate in Melbourne. The simplest and most common type of staircase is the straight staircase. It’s a straight line connecting one level to another, no turns or curves. Straight staircases are the most common type of staircase and don’t require special support. It allows for easy installation of railings, but it takes up a great amount of linear space. It, alongside L-shaped and U-shaped stairs, could be easily designed to have storage space underneath the staircase. L-shape stairs are also quite common, and is just a straight staircase with a turn, making an “L”. They’re more aesthetically appealing, occupy less space, and could be installed at a corner. They’re relatively more expensive than straight and need support for the landing and the turn. The aptly-named U-Shaped staircase consists of two sets of stairs with two turns going the opposite direction making a “U” shape. It takes up less space and works well with corners, but makes it difficult to move large furniture and appliances to and from different levels. Winder stairs is an L-shaped staircase that curves (or winds) slightly towards the floor it connects to and has a separate landing for the turn. They’re normally found in older residences, and were rarely used as the main or front stairs, but were commonly used as an alternate access to the other floor. They take as much (or maybe even less) space than the L-shape due to the absence of a landing and are regaining their popularity. The spiral staircase has one central post in which the steps are attached, spiralling upward/downward to the second level. They require very minimal space but have become more of a novelty than a functional structure. 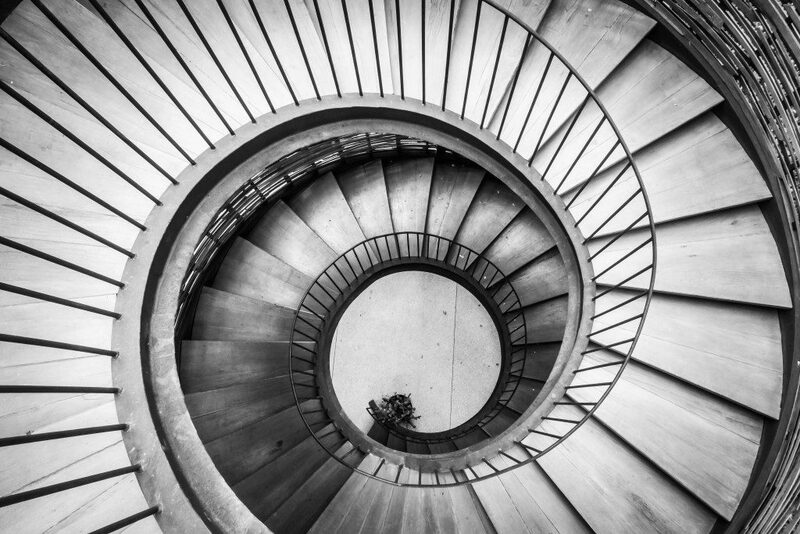 Spiral staircases are often used as an alternate or secondary access since it’s more difficult to navigate and make it very difficult to transport medium to large sized appliances and furniture. This variation of the straight staircase is ideal for smaller residences and is perhaps the most space-efficient of all. They resemble a ladder leaning towards another wall/level, and require taller steps which may be more difficult to climb (and more difficult to come down from). Another variation of the straight staircase consists of treads with no risers, and are seemingly attached individually to the adjacent wall. Split Staircase or bifurcated stairs are often found in large homes, and situated at the entryway. It consists of a staircase with a wide flight at the bottom which narrows down as it goes up, then it stops at a landing which splits into two sets of stairs facing the opposite direction. Split staircase arguably takes up the most space and is quite expensive. So, when planning your future home’s layout, or your current home’s remodelling project, keep these different types of stairs in mind. If you can, take the extra “steps” to make your stairs as stylish as it is functional. The marriage of style and structure would make your home a cosy and beautiful place to live in.